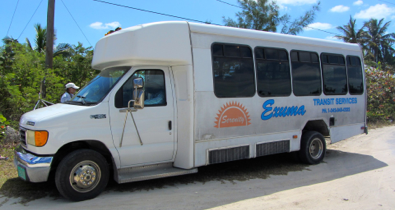 Yesterday we went on a bus tour from Georgetown to the northern end of Great Exuma. The cost was $30 each, including a buffet at a restaurant. There were 66 cruisers on the tour and they took us in two comfortable buses. We made a few stops along the way and the driver pointed out various landmarks. The tour guide was on the other bus, but our driver knew the area and told us interesting facts. One stop was at a statue of a slave named Pompey. 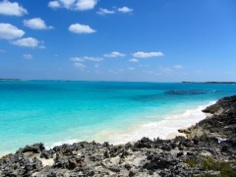 In 1830, a slave owner’s agent attempted to transfer 77 of his slaves from Exuma to Cat Island. Pompey, who was a 32 year old slave, led a group of slaves who hid in the bush and then stole a boat and went to Nassau. They were eventually returned to Exuma and allowed to stay there. 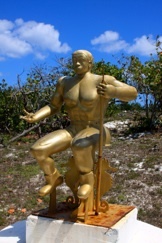 This was the first victory for Bahamian slaves and began the Bahamian anti-slavery movement. In 1833 the slaves were freed in the Bahamas. Another stop was at the burial ground of three slaves, called the Hermitage Tombs. 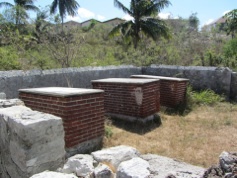 A family from the Carolinas came to the Hermitage Settlement in Great Exuma with their slaves. The ruins of their house is on the hill above. We also passed through a settlement called Roker. Al Roker’s father was born in this town on Great Exuma and his mother was born in Jamaica. The Today Show weatherman visits Great Exuma occasionally. Various farming areas were pointed out to us, but little farming is done here now. The ground is mostly rock, and our driver told us that the young people have no interest in the back-breaking work of growing vegetables. 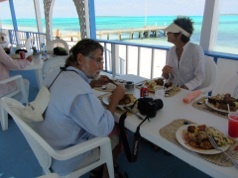 We stopped for lunch at Exuma Point Restaurant and Grill. It was an “all you can eat buffet” with typical Bahamian cuisine: peas and rice, conch fritters, barbecued ribs, deep fried chicken, brown rice and beans, conch stew, macaroni and cheese, fried chicken legs, pork chops, cole slaw, tossed salad and macaroni salad. Drinks cost extra, as did the rum cake for dessert. They played some games with us and had drawings for prizes. One couple got a lovely basket for having the longest marriage...47 years. We walked down the beach to a cave, but it was quite small. The photo on the left shows the view of Exuma Sound from the top of a hill near the restaurant. As always, it is easy to take breathtaking pictures when overlooking the water in the Bahamas. We have had a busy week. On Thursday we went to a dance, which was the final regatta event. Chat ‘n Chill’s wooden deck was packed but we figured since many dances have been held on the platform over the years, it was probably solid. I learned knees that have no cartilage don’t do well after a few minutes of dancing so won’t be doing much of that anymore. The weather has been changeable so we have gone back and forth between various anchorages in Elizabeth Harbor for better protection each time the wind direction changed and strong winds were predicted. We liked the area by Peace and Plenty Restaurant because we were the only boat in that anchorage. There is a saying that if no one is anchored where you are, there is probably a good reason. However, we liked not being in a crowded anchorage when the wind was blowing strong. A few afternoons ago there was a get-together on the beach honoring Skip and Cherylle on Eleanor M. They have been coming here for many years and are now returning to New Bern, NC to become CLODS (Cruisers Living on Dirt). Skip has done many things to help the Georgetown cruising community including clearing trails crossing over to the Exuma Sound side of Stocking Island. They come to Georgetown early in November and Skip cleans up the trails before other cruisers arrive. Cherylle has been in charge of Sunday Beach Church. They never look for thanks or acknowledgement. it was apparent from the turnout that they are well loved and will be missed. Afterwards, we had dinner at the St. Francis with Cathie and Tom (Interlude) and then they came over to Seas the Day to play Mexican Train. We had gone to the grocery store earlier and bought Breyers Cherry Vanilla Ice Cream. Most of the dairy products in The Bahamas are relatively inexpensive, but for some reason ice cream is double the price it costs in the States. We paid $8.45 for a 1.5 qt container. It was worth every penny when we served it with freshly made Ghirardelli Caramel Turtle Brownies. Mmmmmm. Now that all the regatta events are over, we are waiting for calm weather to sail back to Long Island. A rally is being organized and we will go with that group. As of now, it looks like we’ll leave on Wednesday. From there, we hope to go to the Jumentos.